Wow. I did not realize it has been this long since I have beem on here. And my goals, well, I did not do what I had planned. My sewing area got ignored for most of this year, still finding it hard to get in there and make a dent in my plans - BUT - I am not gong to beat myself up for that!! It is what it is and the only thing I can do is live for today and move on from here. What have I been up to you might be wondering. Well, dealing with health issues: these are not fun!! But I will keep my postive attitude about this part of my life and just keep knowing my (and yours!!) body is made to heal itself, I just have to give it what it needs. And I am. And am finding new and exciting things that will keep this healing path going. And my passion for reading is still as strong as it has always been. So my book collection is just growing and growing - I need a couple more book cases, and I am not kidding. My hubby made a comment one day about this 'problem' lol, but he said it would probably be an issue if I didn't re-read them!! And I do. What is your type of book to read, if you read?? I love to read acualy factual books. Used to read myterys and books to 'take you away', but find I love to learn. I am now reading about running my own business. I would love to create a business that gives me new people to meet and creates enough income to make it so my husband does not have to work the hours and out in the cold like he does now; and has all of our years together. Cnn I do this? Yes. Yes, I can and I also know I will. Have you ever thought about having your own business??? Want to join me in mine?? lol Ahhhhh. I am glad to have found this blog again, I was looking for it, but could not seem to find it then here it is!!! Hello everyone. I AM BACK!!! And let the next 12 months not have me silent on this end. I need to be more social. I can be such a hermit and that is also a habit I want to work on - get me out and about and not hiding with my crazy dog and this TV taking up my time. Not a good use of my time at all - the dog yes, he is great, he makes me move and keeps me moving, but I want to move more and be more active. This is just a wierd post of random thoughts - I did not plan to write anything tonight, but I am also going to let my wrting stand as is. I have been reading books that ask questions to answer, and that has made me think random thoughts, and I think I just needed to let some out of my head!!! lol Thanks for reading, if you are still here!!! Talk again soon. Happy SNOWY November 1st. And I have spent this day sewing. On the go right now, I have "Four Patch X" from Bonnie Hunter's book, 'More Adventures with Leader & Enders'. Also, my l/e project, the spools is in there to. I am in no rush to get these little spools done, but what I really do want to do with these is get them cut out of my scraps. Goal for these little guys is to have each in it own fabric. That in itself is challenge and yes, I have found twins and sometimes even more of the same fabric. Those have been removed for use later.... possibly as a baby quilt?? Will not worry about in now, lets see how I feel about these matches when I am closer to the finish line. Who is going to really see pairs anyway in that many blocks?? Okay, since this picture thing is new to me and this is not the one I wanted to post, it is here now ........anyway, I was going to show you this later because because I think it's funny. This house blk was made in July, and I choose to put the snowman looking out the window because it was way to hot for him to be outside! So he has to stay inside in the air conditioning so he would not melt. Well, today he can come out - with the weather we are having here today, he will be fine, believe me!! At the bottom right of this picture, see the blue bow-tie blk? Well, that is another Bonnie Hunter pattern that I had to see what the block would look like in 'real life'. I have made 3 of these so far and yes I do plan on making more. I like them. There. This is the picture I ment to share, These are my spools. The bottom of the picture is just messy things in my space, no reason for them to be there. I also have a picture of my 'x' blks but where it is, I don't know....... Need to figure this out, to make posting pics fun. This is not fun for me right now because I don't know where to find them once I have taken them??? LOL It is just me, I will get used to this. Also, when I used my phone to take these pics, I realized - I move!!..... and that is not always the effect I want!! So, here is the start to my new adventure. I forgot how much I like to read blogs. I enjoy being here. Here is to a good month of making memories. Where you are does not determine where you can go. Like right now, I have blocks, a few of them, on my ironing board - isn't that where you put blocks you have no idea what they are, what pattern or quilt they are for and now, they are sitting there...... This has to change!!! I love to start things, it is a very bad habit that I have to break. And this this is more of a challenge than I thought it would be..... 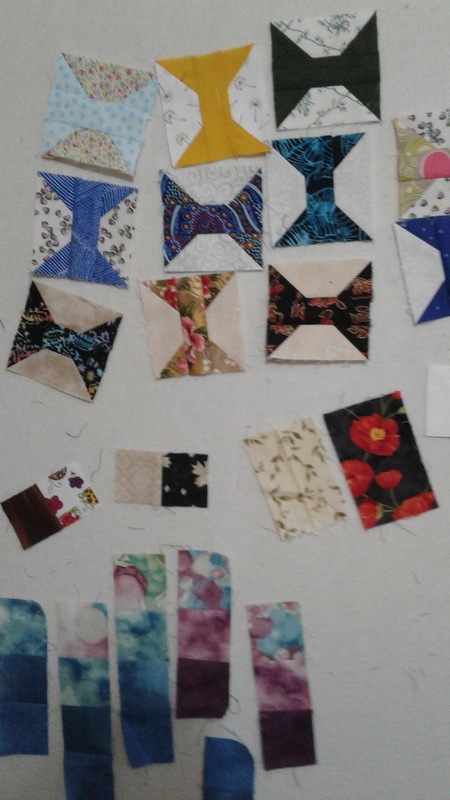 Right now, I am itching to go and start cutting for a couple new-to-me quilts I could do, but what about the 100 waiting for some attention right now I have in my room???? 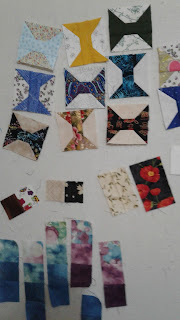 (and I am not kidding........) I am going to use this blog as my own journey in this quilting world I have - a picture of my projects shows in progress, and at different stages, to keep me motivated and to have you join me on my journey. This way, I have more than one reason to keep at ONE project at a time. My willingness to make a change for the better in my crafting life, and to show you what I am accomplishing. I will be back to post a pic. of two quilts waiting to have binding sewn on them - then I will post them again, when they are done!!!! And now I am off to cut more pieces for one quilt in progress and make some room on my table to get those quilts binding sewn on! Well, it took me all day with all my lack of computer knowledge and now, I think I am actually creating my first blog post in MONTHS! I just wanted to come on to say I am well, enough, and that I want you and yours to have a VERY MERRY CHRISTMAS!!!! 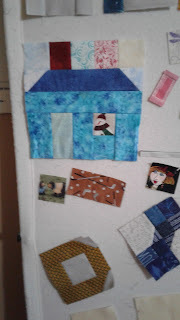 I have been sewing - sort of - and like last year around this time, I had plans for the new year. Same goes now, I want to basically finish what I wanted done last year, so not much has changed there. What am I working on right now? Well, Fair and Square. Bonnie Hunters pattern but I told my guild that I want it done by the end of January. And I mean it. I also want my Jamestown - another of Bonnie's quilts that I have spoken about before. This one I want off my shelf by the end of February. My next big project on the 'get it done' list is my Star Splitter. A Victoria Findlay Wolfe patten where you make your own fabric and then make that into a big quilt full of stars and fun!! And of course, I have little blocks and other things to distract me. BUT - and hold me to this if you have read this far - those three project, the big one, please hold me to it and make me tow the line and get then DONE. And this does include the binding. It is not done till this part is done. And with this picture-less post, I am off. But my total frustration at NOT being able to get on here all day, is now over and I can come and visit with ease. But not if I don't sew too!!!! I will get it together. If I don't, who will?? Talk soon! Brenda!!! I am glad to see you!! Come and visit and let me know what you think.